The film industry in Honduras and the rest of Central America thrives with globalization of new technologies, low costs and international festivals. Central America was united as one nation for a brief and volatile period in the mid-19th century following independence from Spain, and the Honduran hero who served as president of the Federal Republic of Central America is the center of a historical bio-pic filmed in his homeland of Honduras by a local production company. Francisco Morazán’s name is often conjured up when discussing the one-time union of Guatemala, El Salvador, Honduras, Nicaragua and Costa Rica – and Morazán became the first Honduran film to be considered for an Academy Award. Globalization is contributing to a new era of cinematic production in Central America due to new technologies and lower costs, GDP growth exceeding 3 percent in four of the five Central American nations, reduced fragmentation in regional film distribution, and increased sponsorship and interest from afar, not to mention that Spanish is second only to Chinese as the world’s most widely used language. Central American productions have a limited life span that starts with release in local theaters. With luck, some are picked by Latin American cable channels like Cine Latino. Increasingly, feature films and documentaries from the region are screened at international film festivals near and far from home, from Cuba to Germany, and receive prizes. The production of Morazán, directed by Hispano Durón, was not without hiccups – the most notorious was the casting of a Colombian actor to play the lead title role. Despite initial reservations, critics and audiences flocked to the theaters and made the film certifiable hit in Honduras. The film centers on the last week in Morazán’s life, culminating with his execution in San José, Costa Rica. By request, Morazán commanded the firing squad that shot him. The movie Morazán was the most successful among more than a dozen other films produced in Honduras that had their turn at local theaters in 2017 with various box office results. Themes of the movies varied from the comedy Cuatro Catrachos en Apuros, or Four Hondurans in Trouble, to historical bio-pics like Morazán. It’s nothing short of an industry boom for Honduras, where less than a decade ago, only one film emerged every two or three years. Honduran director Tomas Chi credits technology. He has averaged a film per year since 2014, including 11 Cipotes (11 Kids), Fuerza de Honor (Honor Force), and just in time for the 2017 holiday season, ¿Y Los Tamales? (Where Are My Tamales?) He explains that making a motion picture was once an onerous venture, with thousands of dollars needed just for production of film reels and processing for cinemascope in local theaters. The arrival of digital technology, both for camera equipment as well as projectors, reduced costs to near zero. Suddenly, the production of a motion picture was within the grasp of dreaming young filmmakers. And they have embraced new technologies. During production, Chi explains how the director relies on devices like tablets to record rehearsals and provide feedback to the actors. The film industry in Central America has no direct ties with the likes of big studio production companies in Hollywood and remains the stuff of dreams for many with the most adventurous investing their own money to achieve those dreams. Most productions require sponsorship from companies in the private sector and, in most cases, the government as well. The region’s banks do not consider filmmaking a viable investment, at least not yet. A distinctive film industry is emerging in each Central American country based on their previous success. For instance, Nicaragua has not produced a fiction film since 2014 with La Pantalla Desnuda, or The Naked Screen. Instead, the local producers have focused on documentaries that have been well received in international film festivals in Costa Rica and Cuba. Two documentaries by local producers opened in December: Las Mujeres de Wangki, or Wangki’s Women by Rossana Lacayo, and Heredera del Viento, or Wind’s Heir by Gloria Carrión. The future of film production in the country looks bright with its acceptance to Ibermedia in 2017, according to Karly Gaitán Morales, Nicaraguan film historian and journalist. Ibermedia launched in 1998 and has since sponsored more than 600 projects, many of them lauded in international film festivals like San Sebastian or Sundance and even with a handful of Academy Award nominations. The program currently has 21 members: Argentina, Bolivia, Brazil, Colombia, Costa Rica, Cuba, Chile, Ecuador, Spain, Guatemala, Italy, Mexico, Nicaragua, Panama, Paraguay, Perú, Portugal, Puerto Rico, Dominican Republic, Uruguay and Venezuela. Costa Rica has become a beacon for Central American cinema with the Costa Rica Festival Internacional de Cine, sponsored by the Costa Rican Center for Film Production, or Centro de Cine, a branch of the country’s Ministry of Culture and Youth. The sixth annual festival closed in December with 10 days of more than 70 feature films, documentaries and shorts in 18 languages shown in theaters throughout the city of San José. Their awards, including three specifically for Central American films, are coveted prizes, and the festival received productions from 35 countries this year. The film industry in Honduras is young, but growing with increasingly ambitious productions and young players. In 2017, producer and director Juan Carlos Fancony of Honduras released Un Lugar en el Caribe, or Somewhere in the Caribbean, with international actors and international filming locations from Los Angeles to the Bay Islands. After its run in theaters, the movie received airtime on HBO Latino, a channel offered throughout Latin and South America, part of the competition for broadcasting market share in fast-growing emerging economies that also provides entertainment for the US Latino market in the United States, about 60 million people, or 18 percent of the population. Latinos represent about half of US population growth since 2000, according to the Pew Research Center. Jurek Jablonicky likewise is leaving his mark on the industry. A Honduran producer of Czech heritage on his father’s side, he studied business administration in Boston, cinema studies in Bilbao and global filmmaking in Madrid, Spain. Upon his return to Honduras, he was aghast to discover that Honduras lacked a selection committee for the Academy of Motion Picture Arts and Sciences. He quickly got to work and started a year-long process of accreditation with the Academy. After filling out paperwork and forming the committee, he issued an invitation for national filmmakers to submit their work. Under Academy rules, only the most recent films could be considered and, in total, 10 films were produced during the eligible cycle and only three submissions qualified. After the committee’s review and a blind vote, Morazán won unanimously. The committee’s announcement boosted Morazán’s run in theaters. 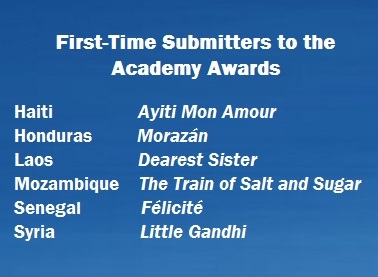 Much like the ephemeral dream of a united Central America during the 19th century, the thrill of the nomination for Morazán was short-lived – the film didn´t make the cut into the nine finalists for best foreign-language film announced by the Academy in December. However, the committee is in place and the road paved for consideration of future films. Jablonicky and audiences throughout Central America anticipate more and better submissions in the years to come. *J.H. Bográn is a bilingual author of novels, short stories and scripts for television and film. He was born in Honduras. The son of a journalist, he ironically prefers to write fiction rather than fact. His genre of choice is thrillers, but he likes to throw a twist of romance into the mix. He can be contacted on Facebook or Twitter. 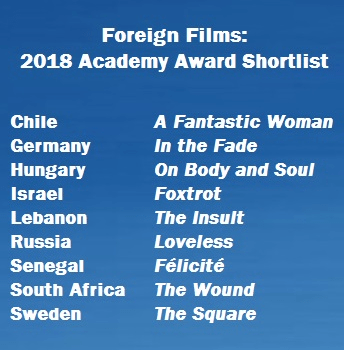 See all submissions for the 2018 Academy Award for Best Foreign Language Film.